OneDrive Files On-Demand helps you access all your files in OneDrive without having to download all of them and use storage space on your device. When you turn on Files On-Demand, you’ll see all your files in Mac Finder and get new information about each file. New files created online or on another device appear as online-only files, which don’t take up space on your device. When you’re connected to the Internet, you’ll be able to use online-only files like every other file on your device. Files On-Demand requires the latest version of Mac OS Mojave 10.14. You can download and install Mac OS Mojave from the Mac App Store. Set up OneDrive to update automatically by opting into either the Office Insiders update ring or the OneDrive Insiders update ring (this link runs a script). 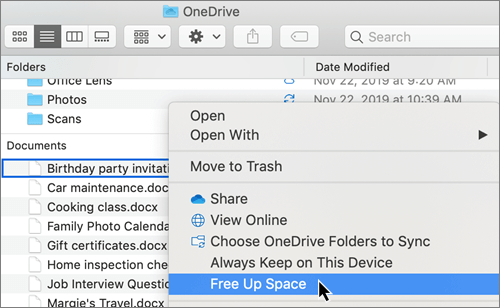 If you've been using OneDrive on your Mac already (it's not a new account), quit OneDrive, delete the json files (*.json) in ~/Library/Caches/OneDrive, and then relaunch OneDrive. Online-only files don’t take up space on your computer. You see a cloud icon for each online-only file in Finder, but the file doesn’t download to your device until you open it. You can’t open online-only files when your device isn’t connected to the Internet. When you open an online-only file, it downloads to your device and becomes a locally available file. You can open a locally available file anytime, even without Internet access. If you need more space, you can change the file back to online only. Just right-click the file and select Free up space. Only files that you mark as Always keep on this device have the green circle with the white check mark. These always available files download to your device and take up space, but they’re always there for you even when you’re offline. 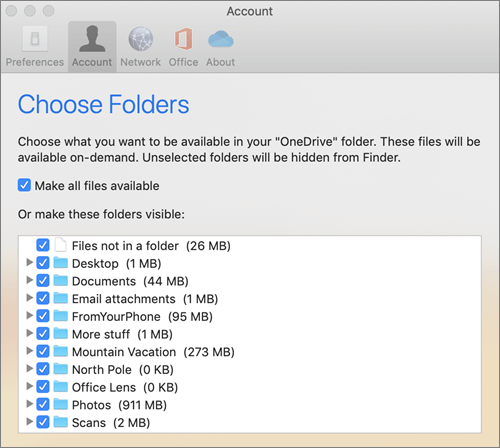 Download and install OneDrive Files On-Demand for Mac. 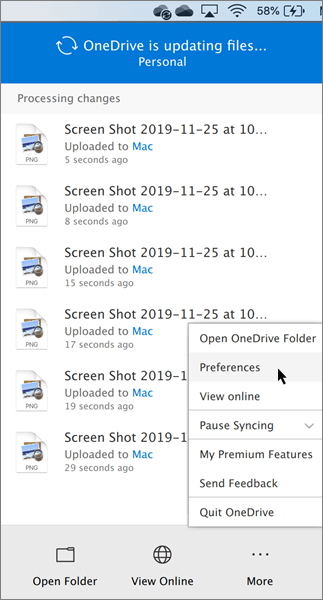 For new OneDrive accounts on Mac OS Mojave, Files On-Demand is turned on by default when you set up OneDrive. Existing users need to turn on Files On-Demand in OneDrive Preferences. 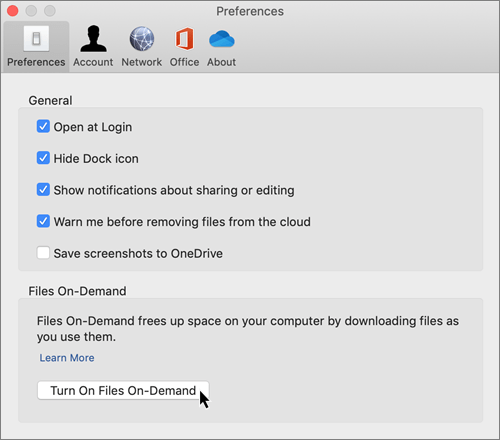 OneDrive Files On-Demand requires an Apple File System (APFS) formatted volume for syncing files. If you've been using a previous file system, it will be automatically updated when you upgrade to Mac OS Mojave. Files On-Demand settings are unique to each device, so make sure you turn it on for each device where you want to use it. Once Files On-Demand is turned on, you'll see the following new options when selecting files or folders in Finder. Press and hold the Control and Option keys. Click Finder in the Dock. 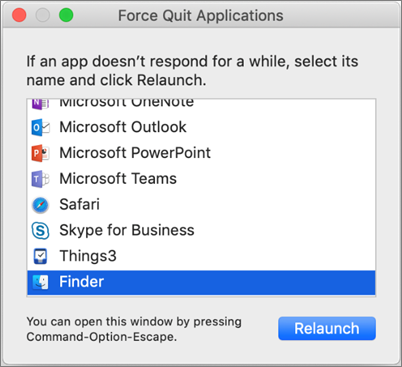 Launch Force Quit from the Apple menu (or press option + command + escape). Select Finder and press Relaunch. New files or folders created online or on another device appear as online-only to save maximum space. However, if you mark a folder as "Always keep on this device," new files in that folder download to your device as always available files. Finder can search for online-only files by name, but it cannot search the contents within online-only files because they aren't stored on the device. Sometimes you might want to make sure a folder doesn't show up on a device for privacy reasons. For example, you might want to hide a personal folder on a work computer. Here's how you do that. 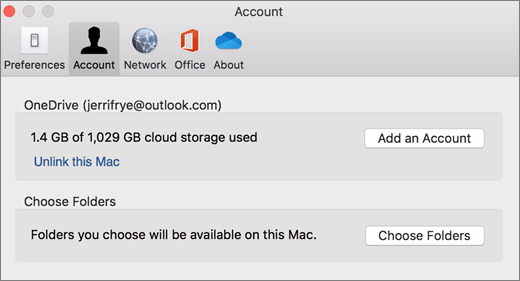 Click the OneDrive cloud icon up in your Menu bar, click the three dots to open the menu, and select Preferences. Click the Account tab, and then select Choose folders. Important: Files On-Demand settings are unique to each device, so you may need to do this on each device where you want to keep a folder hidden. Can I move online-only files within my OneDrive folder? Yes, you can move online-only files within your OneDrive folder for that OneDrive account. When you move files outside that OneDrive folder, the files download to the new folder and are removed from your OneDrive. If you accidentally delete something, you can restore files or folders by going to your OneDrive recycle bin. What happens if I delete a file or move it to the trash? When you delete an online-only file from your device, you delete it from your OneDrive on all devices and online. You can restore deleted files and folders from your OneDrive recycle bin on the web for up to 30 days. If you delete a locally available file, it also appears in your device recycle bin. If you want to hide a folder on your device, see Choose a folder to hide on your device. Does changing a file to online-only delete the file from my OneDrive? No, changing a file to online-only doesn't delete it from your OneDrive. The file no longer takes up space on your device, and you will still be able to see the file from OneDrive mobile apps or on the website.